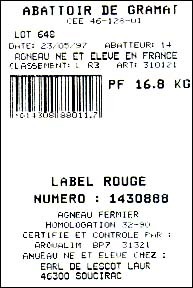 - S ince 1982, the DESTREL company has set up a high performance système of pedigree lists, in order to attest the products' origine. As soon as they are born they are TIP-TAGGED and are recorded in a lambing book or sheepfold registre. up showing the breeder's code, date of sale, delivery hour, number of lambs as well as their TIP-TAG number. -Arriving at the slaughterhouse, the animals are sorted into separate groups. 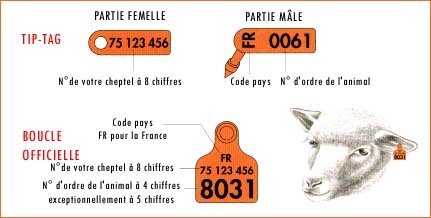 The entrance into the shed has a slaughter number and this number also indicates the breeder's and grouping's code, the allocated lot number, the date and the weighing number of the animal. -The fiscal weighing is followed by an individual weighing form which includes all the above information, as well as the weight and classification of the animal. A ticket is issued and placed on the carcass. At the point of sale of both carcasses and cuts, a pedigree form includes all necessary information, i.e. 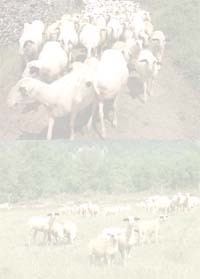 :place of slaughtering, carcass weight, classification and name of breeder. 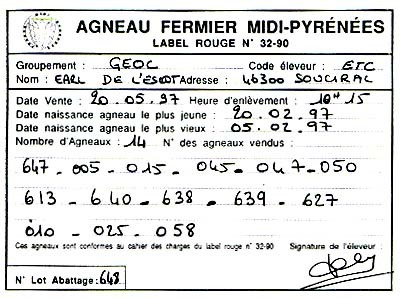 This synthetic form accompanies the group up to its final point of sale.